It’s not a task many of us relish, but gathering the required documentation to secure a valid, government-approved photo identity card or driver’s license is an inevitable chore of contemporary life. As a new transplant to the Midwest, I was recently obligated to do so. After retrieving all necessary documents, I set aside time in order to get to the motor vehicle commission, wait my turn, and be dully processed. Once successfully completed, all paperwork was filed back away for safekeeping and my new photo ID was tucked away into a secure but accessible place for future need. With my identity validated by the state of Indiana, I could now go about the normal business of life, career, and calling once again. How different it is when demonstrating our identity as a disciple of Jesus. While churches keep (somewhat) detailed records of baptisms and membership rolls, the burden of proof regarding Christian identity is less about paperwork but the type of life we live on an ongoing, daily basis. Early Methodists might have been identified and received their name from others because they methodically and regularly engaged in particular acts of piety and mercy (e.g., prayer, Scripture reading, visiting the sick, and the imprisoned), but Wesley refuted the idea that the identifying marks of a Methodist was due to any particular activity. 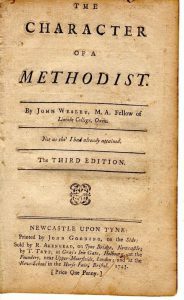 His tract detailing the distinguishing marks of Methodists is aptly titled The Character of a Methodist – in which he explains it isn’t a particular set of opinions, phrases, actions, or customs that make one a Methodist. Rather, it is having a heart filled with the love of God and seeking to love God and neighbor with all one’s heart, mind, soul and strength that made one a Methodist. Furthermore, Wesley rejected the notion that Methodists were any particular kind of Christian, and that their manner and character was consistent with the scriptural witness that bore testimony to plain, common Christianity. The term disciple was not in vogue in Wesley’s day, so his description of a Methodist took its cue from Scripture as one who “having the mind that was in Christ” (Phil 2:5) and who “so walked” as Christ “also walked” (1 John 2:6). In other words, the same self-sacrificing love of Christ that distinguished Christians, motivates and characterizes the practices and habits that early Methodists incorporated into their everyday lives. Baptism within United Methodism is often associated with Christian identity. The early church taught that through baptism (mostly for adults) one received a new identity as a Christian. The ritual of baptism was understood as dying and rising with Christ. In Colossians, Paul speaks of baptism as putting to death the earthly nature so that, hidden in Jesus, the baptized could rise and be clothed in garments consistent with the virtues of Christ. But before those new clothes could be worn, the old ways of sexual immorality, impurity, lust, evil desires, greed, idolatry, anger, rage, malice, slander, foul language, and dishonesty must be stripped away (Col 3:5-9). Then, the clothing of compassion, kindness, humility, meekness, patience, forgiveness and love could be put on (3:12-14). And while Wesley preached the acceptance of God’s justifying grace at the new birth resulted in Christian identity (as opposed to [infant] baptism), he understood the need to remove old habits and manners in order to acquire new. Accordingly, the General Rules of the Methodist Societies were (1) to do no harm, (2) to do good, and (3) to attend on the ordinances of God. A guiding principle holds true: a Christian, as a child of God, surrenders their own identity to Christ and begins to live in new ways that yields fruit of the Spirit. Whereas securing a government photo ID requires time apart from a normally scheduled life, Christian identity is infused into every moment of our lives. Yes, we might carve time into our weekly lives to attend worship, pray, participate in studies, or assist someone in need, and early Methodists may have had class tickets recording their attendance to admit them to Society meetings. But there is a difference between incorporating acts of devotion, compassion, and justice into the rhythms of life and waiting for time and circumstances to align themselves that we can accomplish another item on our to-do list. Discipleship is not an activity that we do on top of everything else. Rather, discipleship is the transcript of our lives, continually shaping and molding us into Christlikeness. Discipleship is the joy-filled response of living out our baptismal vows (whether made by others on our behalf or not) and bears living, vibrant proof of our identity as children of God.